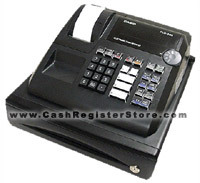 Casio PCR-T26s Electronic Cash Registers at Cash Register Store. The Casio PCR-T26s serves as a lightweight easy to transport simple cash register. If you have a kiosk or perhaps a spot in a farmers market, the PCR-T26s' small footprint will save you precious space. Basic features include 5 direct department keys and up to 10 departments with shift levels, 100 plu's, 8 clerks, 3 payment media and a media slot in the cash drawer to insert larger bills or checks.